In this post I would like to discuss a practical approach to implement the delta-hedging for volatility trading strategies. While it is customary to assume a continuous-time hedging in most of the industrial applications and academic literature, the delta-hedging in practice is applied in the discrete time setting. As a result, to optimise the delta-hedging for the practical implementation, we need to consider the discrete time framework. That is why I would like to highlight some of my research and discuss my approach under the discrete time setting and the transaction costs to optimize the delta-hedging. To start with, in practice, we deal with the two types of returns volatility: the implied volatility and the realized volatility. On one hand, the implied volatility is a forward looking estimate of the returns volatility implied from options market prices. The lognormal volatility in the Black-Scholes-Merton model measures the implied volatility at a specific strike price and maturity date. On the other hand, the realized volatility is computed using available time series of price returns. Also, we usually use some estimator for the expected realized volatility, which we apply to generate signals for volatility trading and delta-hedging. Volatility trading refers to investment and trading strategies that provide the exposure to the implied and realized volatilities of underlying asset, without assuming any exposure to the performance of the underlying asset. Nevertheless, one word of caution is that, in the equity markets, it is very difficult to de-correlate the P&L of volatility strategies from price returns given the very strong correlation between both the implied and realized volatilities and returns, especially so over short-term periods. For brevity, I will only consider the delta-hedged strategies under the so-called sticky strike volatility dynamics meaning that the level of implied volatility does not change when price changes. I also assume that the option position is related to a single expiry and the position is held to maturity, so that the primary risk to the terminal P&L depends only on the realized path of price returns and not on the realized path of the implied volatility. For interested readers, I provide a quantitative analysis of these effects in this paper. 1) Given a spread between expected realized volatility and current implied volatility, say of 2%, what is the expected P&L that can be generated at the option maturity by the delta-hedging strategy under the transaction costs? 2) What is the expected volatility of the profit-and-loss (P&L) of this delta-hedging strategy? 3) How to optimize the Sharpe ratio for the delta-hedging strategy using algorithmic and deterministic rules for the rebalancing of the delta-hedge? To provide quantitative solutions to these questions, I develop a mathematical model for the delta-hedging P&L. As an example, I consider an at-the-money (ATM) straddle, which constitutes a long position in an ATM call option and an ATM call option with strikes close to the current spot price at the contract inception. For a short position in the straddle, the P&L of the delta-hedged position is the time decay of call and put options measured by their theta. In the best case, the stock price will not change so that the P&L reaches its maximum value equal to the straddle theta times the time passed since the last rebalancing. For simplicity, I assume no funding costs and no dividends. Where the first term is the time decay measured by the option Theta, the second term is the delta term related to the change in price measured by the option Delta, and the third term is the option Gamma term multiplied by the price change squared. We ignore the higher order terms as their impact is much smaller than the impact from the first three terms (this observation is valid for near at-the-money options). 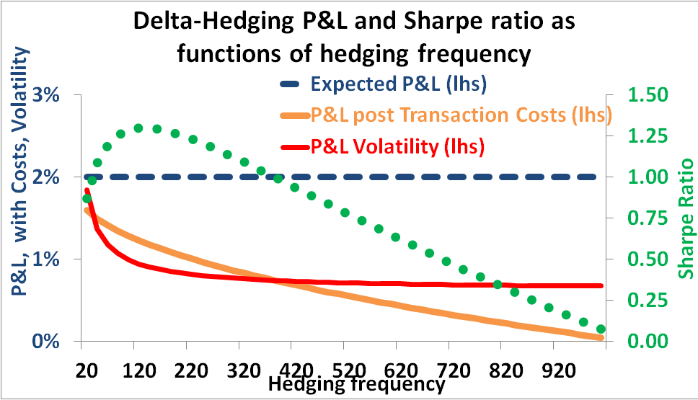 Figure 1 illustrates the profile of the P&L generated by the short delta-hedged position. The green line corresponds to the straddle Theta, which is the gain we receive independently from price return. The red line represents the loss from change in the option price arising from option gamma times the return squared, which has the shape of a parabola. The total P&L is obtained as the sum of the theta and the short gamma P&Ls. As a result, the short straddle position will have positive P&L whenever the absolute value of the realized return is less than the implied volatility times the square root of the time period between delta-hedge rebalancing. The ability to accurately forecast the expected realized variance and to determine whether the spread is large enough to generate the excess return post transaction costs. The ability to forecast the risk of the strategy and to compute the risk-reward metrics of the strategy. where the index n denotes the n-th rebalancing time. This result is remarkable because it holds under different dynamics of price returns under the statistical measure. In the continuous time setting, this result is first obtained by El Karoui et al (1998). By extension, I show that the same result in the discrete setting is valid when returns include jumps (Sepp (2012)) and stochastic volatility with jumps (Sepp (2013)). An important consideration here is the assumption that we can compute the delta-hedge consistently with the statistical dynamics of price returns, so that we can eliminate the exposure to the realized drift. This is a significant topic in itself, which would deserve a separate post. For now, I refer the interested readers to my recent paper on this subject. Finally, we see that the primary risk driver of the P&L is the realized volatility of price returns. For non-vanilla products, which require some vega/volatility hedging, and for strategies, when the option position can be terminated before its maturity, the risk of changes in the implied volatility can be significant. As a result, when the risk of changes in the implied volatility is significant, we need to model the dynamics of the implied volatility as well. However, for trading strategies in vanilla options held to maturity, the risk of returns volatility under the statistical measure is the primary factor that we need to model, while the implied volatility serves only as a measure of initial costs and as an input to compute the delta-hedge. The remarkable observation is that this result is independent from the hedging frequency. The expected P&L is shown in Figure 2 with a blue dashed line, which does not depend on the hedging frequency. The primary risk for the P&L volatility comes from the volatility of squared returns and the residual volatility arising from the spread between implied and realized volatilities and the stochastic volatility and jumps in price returns. Derman (1999) first makes the observation that, when the implied and realized volatilities are equal with zero spread between them, the part of the P&L volatility that we can eliminate by delta-hedging is inversely proportional to the hedging frequency. I extend this result to the case of non-zero spread under the stochastic volatility and jumps. At the beginning, I assume that the re-hedging is applied at equidistant times with the time periods equal to the option maturity time divided by the hedging frequency. Then I incorporate delta-hedging using price and delta bands. The more frequently we delta-hedge, the more P&L volatility we can eliminate. The residual volatility, which cannot be eliminated by delta-hedging, arises from the two sources. The first course is the difference between implied and realized volatilities. The second source is the un-hedgeable delta risk due to jumps and gaps in the price. Figure 2 illustrates the P&L volatility by the red continuous line. When the hedging frequency is small the P&L volatility is high. By increasing the hedging frequency the P&L volatility declines but the reduction becomes smaller and smaller as the hedging frequency increases. Transaction costs occur when we buy or sell the stock to cover our delta. When we rebalance the delta hedge given quoted price S, our buy orders are executed at price S*(1+0.5*BidAskSpread) while sell orders are executed at price S*(1-0.5*BidAskSpread), where BidAskSpread measures the bid-ask spread. Delta-hedging with transaction costs is first considered by Leland (1985). Figure 2 illustrates the P&L post transaction costs by the continuous orange line indicating that the expected P&L declines as we increase the hedging frequency. Figure 2 displayes the Sharpe ratio as the green dotted line. We can clearly see the humped shape of the Sharpe ratio. As we start increasing the hedging frequency, the P&L volatility declines, which increases the Sharpe ratio. However, as we keep increasing the hedging frequency, the transaction costs increase while the P&L volatility drops as a slower rate, so that the Sharpe ratio begins to decline. What we are interested in, is to find the optimal hedging frequency that maximizes the expected Sharpe ratio of the volatility trading strategy. The analytic solution for the optimal hedging frequency can be found in my paper. To compute the expected Sharpe ratio and the optimal hedging frequency, we need to estimate the expected volatility of asset returns. This is the part where we need to make assumptions about the dynamics of price returns under the statistical measure and apply econometric tools to estimate parameters of the model for returns under the statistical measure. In the abovementioned paper, I consider the four dynamics for the returns process under the statistical measure: the diffusion process as in the Black-Scholes-Merton model, the diffusion process with jumps as in the Merton model, the stochastic volatility process as in the Heston model, and the stochastic volatility process with jumps in returns as in the Bates model. Intuitively, the diffusion process will imply that a larger part of the returns volatility can be delta-hedged with the residual volatility coming only from the spread between implied and realized volatilities. When we apply models with jumps and stochastic volatility, the residual part of the P&L volatility increases because jumps and stochastic volatility cannot be hedged away by the delta hedging. As a result, we expect different Sharpe ratios and optimal hedging frequencies under different assumptions about the returns dynamics. The expected P&L does little depend on the model assumptions since different models would imply both similar values of the expected returns volatility (if these models are estimated using the same data set) as well as similar values of the expected transaction costs. However, estimates of the P&L volatility are bound to be different under different model assumptions. Figure 3 shows the expected P&L volatility under the diffusion model by the red dotted line and under the SVJ model by the red dashed line. We see that the stochastic volatility with jumps (SVJ) model implies a higher volatility of the P&L which is also less sensitive to the hedging frequency. On the right y-axes, I show the expected Sharpe ratio under the diffusion model by the green dotted line and under the SVJ model by the green dashed line. We see that the SVJ model implies smaller Sharpe ratio and the optimal frequency should be smaller than the frequency implied by the diffusion model. Another interesting implication is reached by analysing the optimal Sharpe ratio across option strikes. Figure 4 illustrates the optimal Sharpe ratio as function of option strike using the diffusion model with the fixed implied volatility. We see that in the absence of the volatility smile, which would assign higher volatility for out-of-the-money (OTM) puts and calls, the optimal Sharpe ratio declines for out-of-the-money options. The reason is that the volatility of the P&L increases faster relative to the expected P&L for OTM options, so that the trading strategies in OTM options have smaller optimal Sharpe ratios. The implication that OTM options have smaller Sharpe ratios, when we apply a constant value of the implied volatility, can serve as an partial explanation for the volatility smiles observed in options markets. If option sellers seek for uniform Sharpe ratios across options strikes, option sellers would demand a higher level of the implied volatility for OTM options to compensate for the higher P&L volatility of delta-hedged short volatility strategies in OTM options. Another interesting implication of the obtained results is the following. Suppose we observe the range of option maturities and for each maturity we compute the expected spread between the implied and realized volatilities. Now we want to choose the maturity that provides us with the maximum Sharpe ratio. We observe in option markets that typically longer-dated options imply a higher spread, however longer-dated options imply a higher P&L volatility and transaction costs. I can apply my approach for a quantitative assessment of risk-reward for options with different maturities. Figure 5 illustrates the optimal Sharpe ratio as function of option maturity for a fixed spread between the implied and realized volatilities. We see that the result is again sensitive to the model assumption about the returns dynamics. As the SVJ model implies a higher P&L volatility, the optimal maturity is shorter than the optimal maturity under the diffusion process. As a result, for a more realistic model that includes both jumps and stochastic volatility, it is optimal to trade in options with shorter maturity. To minimize the transaction costs, it is robust to rebalance the delta hedge when either the spot price or option delta changes by some pre-defined amounts. In my paper, I consider the two cases: one when the hedge rebalancing is based on bands for the price change and the second when the rebalancing is triggered by changes in option delta. Since price and delta based rebalancing imply a random number of re-hedging times, the P&L volatility as well as the realized transaction costs will be different when compared to the strategy with re-hedging at fixed time intervals. However, I derive first order approximations to obtain the bands that are equivalent in expectation to the time based rebalancing. Figure 6 illustrates the Sharpe ratio obtained by using both the analytical formula as well as Monte-Carlo simulations of the delta-hedged P&L using time and the equivalent bands. The analytical Sharpe ratio is shown with the black colour. The other three quantities are computed using the Monte Carlo simulations. The Sharpe ratio of the delta-hedging strategy with the same time based rebalancing is shown with the red, the Sharpe ratio of the hedging strategy with the equivalent price band is shown with the green colour, finally, the Sharpe ratio of the strategy with the equivalent delta band is shown with the blue colour. From Figure 6 we conclude the following. First, my method provides a very good approximation to the actual Sharpe ratio obtained by Monte Carlo simulations under the time-based re-hedging. Second, my approximations to convert the time based rule into the price and delta bands also provide a reliable estimate for the Sharpe ratio. I remind that, under the strategy with the price and delta bands, the actual number of re-hedging times is different across different realized price paths. Using the approximations for the price and delta bands, we can first find the optimal hedging frequency for the time-based re-hedging and then apply these approximations to get the equivalent price and delta bands. As we expect, using the price and delta bands increases the realized Sharpe ratio as these strategies allow savings on the realized transaction costs. I have described a quantitative approach to improve the performance of the delta-hedging for volatility trading strategies. The key to my approach is to consider possible dynamics for price returns under the statistical measure and derive analytical formulas for the expected P&L of the delta-hedging strategy, transaction costs, and the P&L volatility. While this analysis can also be performed using Monte Carlo simulations, my analytic approach provide a fast and an accurate way to estimate the risk-reward characteristic of a delta-hedging strategy and my method can be implemented in a system for real time computations. Also, I have demonstrated that the Sharpe ratio of the delta-hedging strategy can be improved by incorporating the price and delta bands for the rebalancing of the delta-hedge and provided analytical approximations for computing the optimal bands to apply in my optimization approach. Derman, E. (1999), “When You Cannot Hedge Continuously: The Corrections of Black-Scholes,” RISK, 12(1), 82-85. El Karoui, N., Jeanblanc, M., Shreve, S. (1998), “Robustness of the Black and Scholes formula”, Mathematical Finance, 8(2), 93-126. Leland, H. E. (1985), “Option pricing and replication with transaction costs,” Journal of Finance 40(5), 1283-1301. Why Python for quantitative trading?